Woody Allen once said that the reason why he makes a new game every year is so that his movies don't become events. A steady stream ensures that the hits don't become that big of a deal. Ditto for the failures. Grasshopper Manufacture's Goichi Suda loves movies, he loves wrestling, he loves t-shirts, and he loves churning out video games. This week in Tokyo, Grasshopper Manufacture has been showing off a whole host of titles, from iOS to Kinect to portables to home consoles. The games are either new or new spins on established titles. "You always new to make new stuff," Suda told Kotaku. That's what Grasshopper has done. Sure, there have been the No More Heroes sequels, but there have also been new game after new game. Suda's at Tokyo Game Show to talk about Diabolical Pitch, Grasshopper's new Xbox Live Arcade title for Kinect. Or is he here at TGS to talk about Chainsaw Lollipop. The game is being published by Warner Bros., and Suda said that he has thought about what it would be like made into a movie. For Chainsaw Lollipop, Hollywood reeled in James Gunn, who Suda called him a "zombie genius". Gunn has worked on a whole host of horror titles. Grasshopper Manufacture has also worked on a whole host of titles. Some of them, like Killer7, are cult classics. Some of them, like No More Heroes, have become franchises. Some of them haven't. Shadows of the Damned, an eagerly awaited collaboration between Suda and Resident Evil creator Shinji Mikami, didn't do the gangbuster business EA hoped it would. It was supposed to be Suda's breakout hit. "You got to keep making new titles. I want to make various kinds of games." 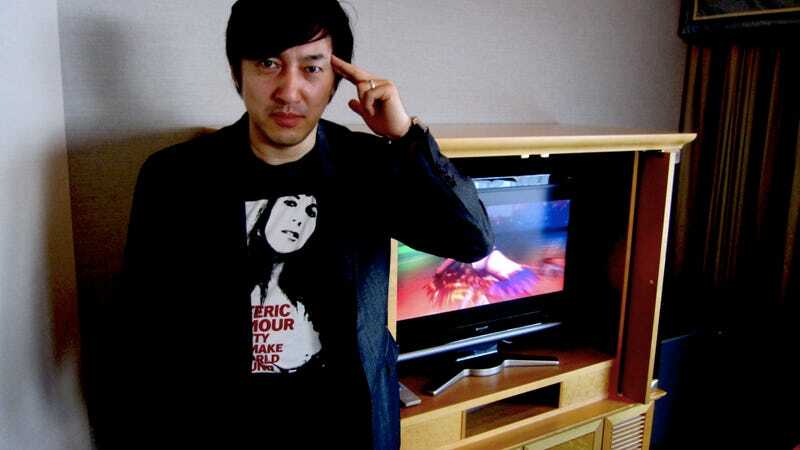 "You got to keep making new titles," said Suda. "I want to make various kinds of games." According to Suda, some games might be successful, while other games might not be. "But you got to keep making games. You got to keep going." Suda asked me if I knew why the company was named "Grasshopper Manufacture". I did not. "Grasshoppers are everywhere," said Suda. "There are grasshoppers near my house, there are grasshoppers near your house." You didn't pick that name because it sounded cool, I asked. "No," he replied. For Suda, the grasshoppers are games. And he wants them everywhere.